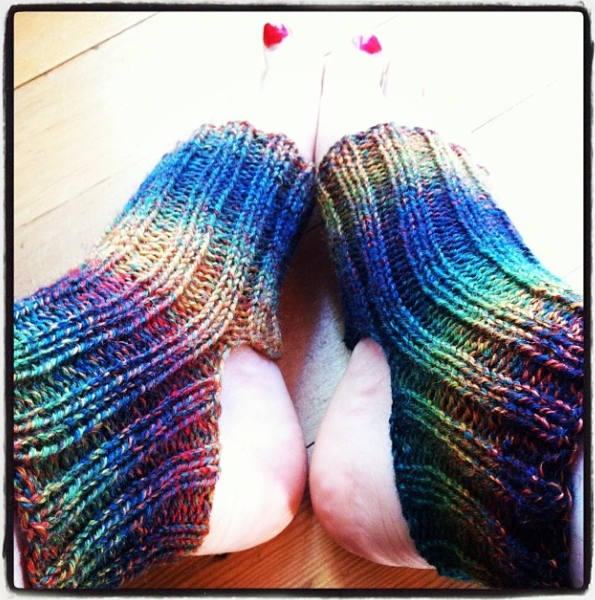 Slate Falls Press: Yoga socks for the dance teacher! Yoga socks for the dance teacher! Yes, it is another handmade gift post. I suppose I am on a roll! I wanted to knit up a little something for our daughter's dance teacher, and thought that a simple pair of yoga socks would be perfect. I confess I had a hard time parting with these sweet socks, they are just like a cozy little hug for your feet. I used scraps of Paton's Kroy sock yarn, and made a pair of yoga socks from about 110 yards of yarn. You could easily get a pair of these socks from one 50 gram ball. I simply cast on 48 stitches, worked 3-4 inches in k2 p2 ribbing, then shaped the heel by binding off 24, working 24, casting on 24, working 24, and continuing merrily on my way for another 3-4 inches. I have a feeling I will be making a lot of these in years to come… they were so much fun to make, are super comfy to wear, and will fit pretty much anyone!